Northern Generator has been providing stand-by and prime power generator system sales and service since 1982. We are factory authorized dealers for Generac, Briggs and Stratton, GE, Onan, Kipor, and Kohler generators in Northern Wisconsin and the Upper Peninsula of Michigan. We also have a full line of transfer switches from each manufacturer along with manual transfer switches by Reliance Controls. Our service department is comprised of factory trained technicians and features an extensive inventory of service and repair parts. We are able to ship parts throughout the country and overseas. Specific areas we cover for generator service and installation are Three Lakes, Eagle River, Rhinelander, Minocqua, St. Germain, Land O' Lakes, and Boulder Junction, WI. A few of our many satisfied customers include Cellular Tower Systems, Notre Dame University, the State of Wisconsin, the State of Michigan, and numerous counties, municipalities, schools, health care facilities and commercial enterprises throughout central and northern Wisconsin. We don't realize how much we depend upon electricity until our service is interrupted. Rooms go dark, appliances won't run, security systems shut down ... even simple things are temporarily on hold. In many homes where electricity is used to operate sump pumps, heating and other crucial systems, the need for continuous power is even greater. 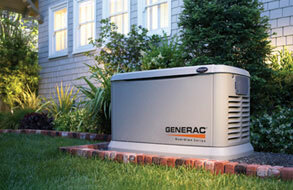 Standby generator power systems from Northern Generator solve the problem. Powered by propane or natural gas, the standby generator supplies electricity when normal power sources fail, providing protection for your property whether you're there or not. A standby power system is a generator set and a transfer switch that continually monitors the quality of electric service from your utility. If the power supply is interrupted, the standby system starts automatically, providing power to all preselected electrical equipment. Unlike a portable generator set, a standby power system is permanently installed, connected directly to the electrical system. For convenience, most small standby systems are fueled by natural gas, so there's no refueling to worry about. And, since gas service is rarely interrupted, the power system stands ready to provide electricity whenever and wherever you need it. The need for a back up power system has never been greater than it is today. In addition to typical weather related emergencies, temporary outages in many parts of the United States have become a common occurrence. The fact is, in many areas our electric utilities are overburdened. Demand continues to grow faster than existing utilities can be expanded to carry the increasing load. And because of prohibitive costs, many new facilities never get beyond the planning stage. Unfortunately, it's a growing trend which ultimately leaves you with a choice: bear with a growing problem or invest in a solution. A standby power system can also provide back-up power for small businesses and offices. Just as in your home, you depend on electricity in the workplace for lighting, heat, office machinery, as well as the sophisticated, specialized equipment that has become critical in today's operations. 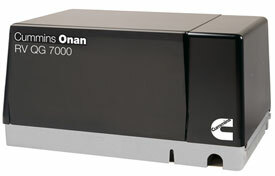 Computerized equipment monitors inventory and maintains customer records. Medical clinics rely on electronic lab equipment and patient monitoring devices. Grocery stores need power for UPC check-out systems, freezers and refrigeration units. In every type of business, when the power is out, operations grind to a halt. A standby power system can keep your home, and your business, protected and running.